It has been a long couple of decades for Pittsburgh Pirates fans. The last time the team had a winning season, Andrew McCutchen was just starting school. Finally, the team has clawed their way back to respectability, thanks in large part to their star outfielder. With that, Andrew McCutchen rookie card prices are starting to rise as more collectors get behind him and his underdog team. 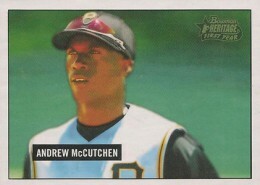 Andrew McCutchen rookie cards were released in 2005. All are from Topps products. Three of McCutchen's rookies are autographed, including the 2005 Bowman Sterling card that also has a jersey swatch. 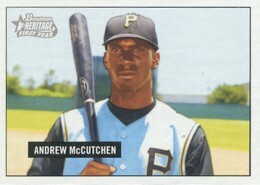 However, these are not the first Andrew McCutchen cards to come out of a MLB set. He was also included on the 2004 Bowman Draft AFLAC checklist. Available in both Bowman and Bowman Chrome versions, the cards were offered via redemption. 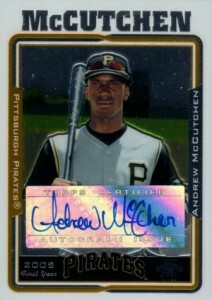 There is also a rare 2004 Bowman Chrome AFLAC Autograph Andrew McCutchen card that has a print run of 90. It was offered to collectors as part of a specially created make-good set in lieu of a Gold Refractor redemption (more redemptions were printed than sets). 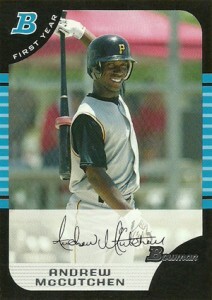 The 2005 Bowman Draft Andrew McCutchen is considered one of his basic rookie cards. It has a clean picture of the future superstar smiling while warming up with his bat. This will always be one of McCutchen's most reasonably priced rookies. Also inserted in packs of Bowman Draft, the 2005 Bowman Chrome Andrew McCutchen rookie has the same design only with chromium card stock. The card also boasts several Refractor parallels that are popular with collectors. Outside of McCutchen's autographed rookies, this is one of the best first-year options. 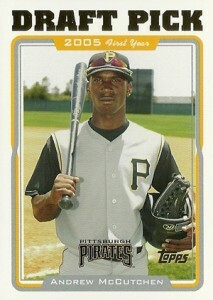 Andrew McCutchen has two cards in 2005 Bowman Heritage: is rookie card and a variation. Both have a horizontal layout. The regular card, a short print, pictures the outfielder wearing sunglasses standing against a green backdrop. The variation has McCutchen clutching a bat. Also included in 2005 Bowman Heritage is a Signs of Greatness Andrew McCutchen autograph. Although an insert, the card is notable for being the only 2005 McCutchen card to have an on-card signature. One of only two Andrew McCutchen rookies to have an autograph, his 2005 Bowman Sterling card is also the only one to have a jersey piece. The card does not give much info about the jersey swatch other than it being playing-worn. Although the autograph is on a sticker, it's integrated well into the card's design. Simple and to the point, the 2005 Topps Update Andrew McCutchen rookie is a good option for those simply wanting to stockpile first-year cards of the Pirates star. Very affordable on the secondary market, the card has a clean image and simple design. 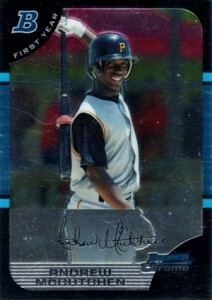 The second Andrew McCutchen autographed rookie, the 2005 Topps Chrome Update card was inserted in packs of Topps Update. The large silver sticker doesn't quite fit in as well as it does with the 2005 Bowman Sterling card. Still, an autograph is an autograph, which is enough to keep this card in demand. There are also several Refractor parallels that are also autographed.